Socialite Huddah Monroe is out here giving advice yet again. We don’t know how many will take it home. The socialite has been having a lot to share lately know that she claims she’s been in a relationship for the better part of 2018. Monroe has asked ladies to avoid giving that cookie to broke guys. 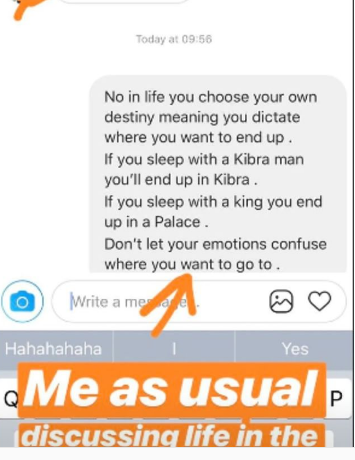 Dishing advice in her DM on instagram, the socialite warned other female from sleeping with poor men because they might end up with them. “Money or Love?” her fan asked. She went on to give an intellectual reply. ”No, in life you choose your own destiny meaning you dictate where you want to end up. If you sleep with a Kibra man you’ll end up in Kibra. If you sleep with a king you will end up in a Palace. Don’t let your emotions confuse where you want to go.” Huddah wrote in response.